JP WEB provides various web hosting plans on Linux and Windows Servers. Whether you need a small personnel website or an extensive database driven website, we have a plan for you. Feature rich dynamic website solutions E-Commerce web portals Intranet applications for business automation Content management system. JP WEB is a rapidly growing custom development and software outsourcing company. Our offshore development department is located in all over India. JP WEB specializes in providing web and software development services including solution integration and offshore IT outsourcing to small and medium sized businesses (SMB) across the globe. Go with us and you can benefit from our 5 year experience, a pool of 450+ IT resources with amazing range of skills, deep vertical industries expertise and excellence in top technologies, like .NET, C#, PHP. JP WEB is a one stop software development company for implementing your business idea as a software solution. You can rely on us to give your company a cutting edge, as we use the most efficient, flexible and cost-effective approach to software development. Have a good time browsing our website, and don’t forget to call or email us we strongly believe in personal communication. We specialize in the development of custom software applications and offshore software outsourcing services. Specifically, our company carries out custom programming, database design, client-server and internet/intranet software application development. Now a day the smart phones are creating a buzz all over the market and are extension of internet and digital technology. Mobile application development process is basically creating an application for mobiles, personal digital assistants and other devices. 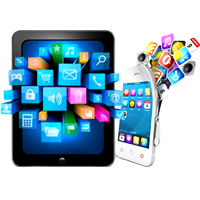 When we talk about mobile application development in patna, JP WEB comes at the foremost position. Whatever type of mobile app you are thinking of, JP WEB will cover it all. Even if your company is thinking to launch an app that is free and later on you want to add in feature for it purchases, we can do that too and also advice you with the perfect pricing plan for your application. As we all know mobile internet usage is increasing all over the world at a fast pace, it is vital that mobile application development is focused on delivering "self sustainable apps." It is necessary that a mobile app deliver full service to the user. JP WEB will provide you with a final product where user will be easily able to buy upgrades, add-ons, subscribe for newsletter and many more without leaving an application. Different Domains we deal in JP WEB as a team of professionals which expertise in different domains such as: iPhone Application Development. iPad Application Development. Android Application Development. Blackberry Application Development. JP WEB provides all types of computer and computer hardware parts in cheapest price. The whole point in having a website for a business is to let people know that you exist. That is exactly why people should find you (your website, we mean!!!) easily when they try to search something related to your business in internet. Search Engine Optimization is the high level strategic online marketing approach which is a key factor in internet world. It comprises of web designing and development consultancy, optimization of meta tags and meta descriptions, optimization of site content, xml sitemap creation, submission to search engine (for eg. Google) and a lot more. We, at JP WEB, provide you all these tools under single roof. Our experts provide you services like article submission, link building, blog posting and lot more. JP WEB believes in providing effective, yet efficient and affordable solution that will cater to all your SEO needs. The packages are optimized for your convenience. Social Media Marketing The social network LINKEDIN has now 313 million monthly active users as in 2nd Qtr 2014. 35% of users check Facebook 10 times a day or more. 625,000 people join Google+ every day. More than 2 million websites have integrated with Facebook. If your business is not engaging with social media you may be missing out on some incredible sales potential. Many businesses still scratch their heads when it comes to the application of social media forgetting that its core it’s just people connecting, discovering and sharing information just as they’ve always done…but online.